I am a student pursuing BTech from new delhi. I am undertaking a project in which I am required to build a recumbent racer bike and then compete in a race. Last year, I built a rear wheel drive short wheelbase recumbent bike but I found that it had an inefficient drivetrain due to which I could not win the speed event of the competition. This year I am planning on building a front wheel drive short wheelbase recumbent bike. Since there is a problem known as heel strike in the case of fixed boom front wheel drive, I am more favoured in building a pivoting boom type front wheel drive bike. With this type of a bike, I am concerned about its slow speed stability. I will be required to clear slalom sections in the race for which I need easy steering at slow speeds. Will it be difficult to steer at slow speeds given the crank rotates while steering? I've built one and ridden a couple of commercially made ones (Cruzbike and a European one) and I have not been very impressed. That design has never done very well at our local races, for example. That's the prototype we built that convinced me it wasn't a design I wanted to go further with. It was quite rideable but there wasn't enough great about it to make it worth choosing that design over something more conventional. 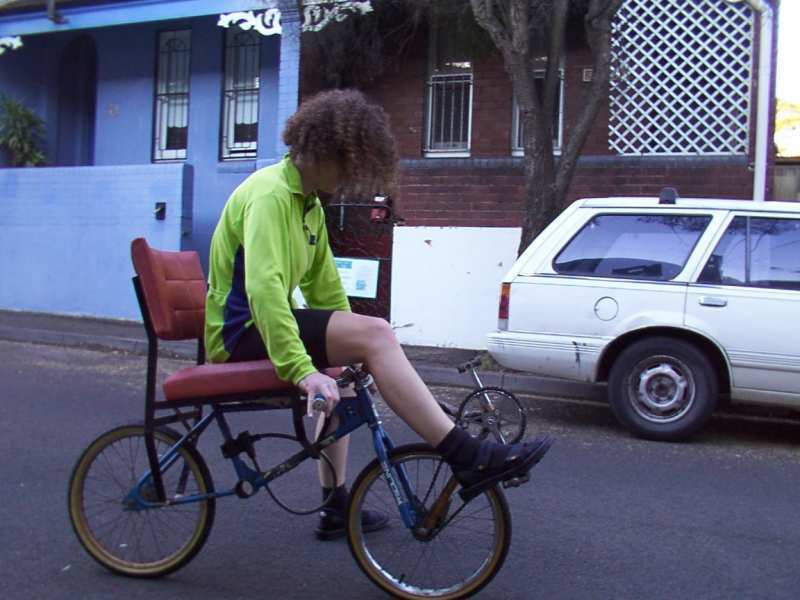 As far as slalom racing goes, you'll obviously be trying to build something lower and more reclined than I did, possibly like the CruzBike RAAM bike. I think it will be worse in the slalom than a fixed bottom bracket bike because pedalling while turning is harder, and at sharp turning angles is impossible. The main problem is not so much the funny angles between the pedal and your ankle, but that the inside leg is pushing out on the steering, while the outside leg is wrapped around the bike and pushing in. That makes pedalling in circles basically impossible so it is very hard on your arms (and the handlebars have to be beefed up to take the extra forces). There are a lot of recumbent designs out there, even if you limit yourself to two wheels. I suggest looking around the homebuilder sites and maybe going to a traditional highracer style SWB bike. The RAAM CruzBike is effectively a highracer, but a steep seat one rather than laid back. Those are pretty easy to build and do better in slaloms than the really low lowracers do (higher CoG means there's less mass moving around the slalom cones). I ride my Cruzbike Silvio to work every day on busy, bumpy roads. I have been doing this for about six months. It seems almost as stable as my Hpvelotechnik Grasshopper, which is totally stable. I have been riding that for years. the Silvio seems to be getting more stable as my mileage increases. My commute includes an off-road short-cut which the Silvio handles well. Some people can ride these bikes no-hands, steering with their legs. I have not mastered this yet. Search for Flevobike. These have their steering pivot-point just in front of the seat. Their handlebars are fixed - they are purely leg-steered.